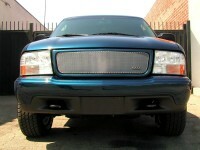 98-04 GMC Sonoma/Jimmy/98-01 Envoy MX Series Sport Mesh Grille. Give your GMC a custom upgrade with this aluminum Sport Mesh Grille. Installs over existing grille. Comes with hardware and installation instructions. Please choose black or silver finish below. To view installation instructions please see below "For more information, please visit this products webpage" . Backed by manufacturers warranty. Made in USA. Grillcraft Custom Products began manufacturing and designing custom grilles for the Sport Compact market in 1995. We have since developed our product line to now offer Sport Grilles for a variety of performance vehicles. Our original grille design aggressively enhances the appearance of passenger motorcars as well as Sport Trucks and Suv's. Our Reaserch & Development Team at GrillCraft is dedicated to offering you the most innovative automotive styling components in the industry. We take pride in our CRAFT and strive to satisfy our customers in every way possible. As always, our products are backed by a comprehensive manufacturers warranty. Need help installing our grilles? Our tech support is only a phone call away. All of our products are backed by our lifetime warranty. Tell your friends about the MX Series Sport Mesh Grille. Share this product on Facebook, Twitter, MySpace or send an email to a friend!